Happy almost weekend, friends! Or, in our case, happy almost birthday to me tomorrow, birthday to Avery Saturday and Mother’s Day on Sunday. Oy. Right about now I’m elbow-deep in streamers, balloons and cake ingredients in preparation for the festivities (and in about 12 hours, I might even be neck-deep. I went a little overboard). You already know how I feel about the whole thing — excited? Yes. Anxious? YES. Have I been looking at old Instagram photos of newborn Avery all week long with heart pangs of nostalgia? I admit to nothing. 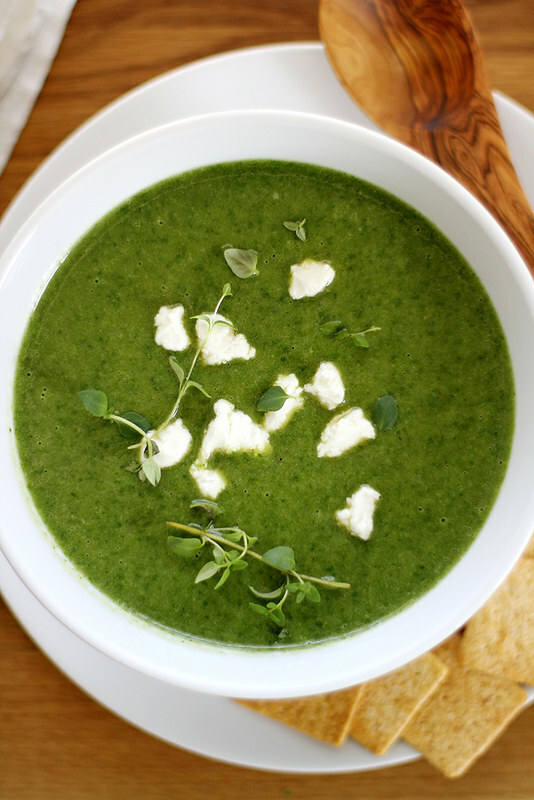 In any case, to keep myself fueled for the week, I’ve been slurping (ew — I mean, politely sipping) this delish greens and goat cheese bisque for lunch and sometimes dinner with a gooey, melty grilled cheese on the side. It’s been just the boost I needed. This soup isn’t all just spring and healthy green veg vibes — it’s also a ton of YUM vibes, what with the addition of golden caramelized onions, fresh lemon juice, butter and creamy, tangy goat cheese. And yes, there is also a mammoth amount of greenery in this soup (like, nearly two pounds’ worth of spinach, kale and chard) so each sip is a spoonful of serious nutrition. It’s my fave kind of food, really. And thanks to my blender, it all turns into a smooth puree of sippable deliciousness. Even Avery has been happily eating it with me for lunch and dinner. I assume she’s preparing herself for a weekend full of cake, too. 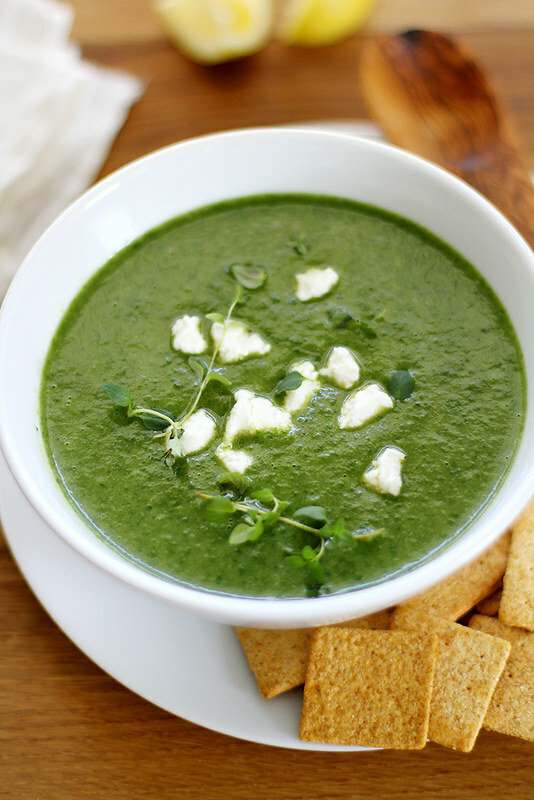 For the tasty, easy and healthful greens and goat cheese bisque recipe, head over to the KitchenAid blog! And have a very happy weekend. Ooh, this looks so green and healthy! I must admit, I also have been needing a bit more greenery in my diet lately… oops. This looks like a great place to start – all that cheeeese. Yum. Happy birthday to you and your little girl! Have the best weekend ever!! Happy birthday to all of you! You’re definitely going to have one busy weekend, but I bet a wee one’s birthday party will be so fun! I can’t believe Avery is turning one already. Where did the time go? Your party plans sound amazing and so does this soup. Pinned. Aaw happy happy birthday to you and your sweet baby girl! So so special! Hope you all have an amazing time celebrating 🙂 Love this gorgeous green soup! I love those dollops of goat cheese, what a perfect bisque for spring! So much happy celebrating this weekend!! I’m sure it’s stressful now, but will be SO FUN. You better go to town on this soup to keep your energy up, though. I am always up for slurping something green! May is seriously one amazing and exciting month for you. I know exactly why you need this for fuel but at least it is utterly delish! Awww what a fun weekend coming!! Happy birthday momma and happy birthday to sweet Avery!! She is going to have a wonderful time at her party 🙂 I’ll have to make this bisque soon. Love that blender!! You have quite the weekend coming up! I’m a day late on this post, which means your birthday is today. So happy birthday!!!! And happy first birthday to Avery. AND happy Mother’s Day to you! What a special weekend! WOW, sounds like you had a very FULL and fun weekend!!! your birthday, your daughter’s and Mother’s Day?! WOW!!! Heading over now for the recipe!!! loved this soup the first time I laid eyes on it!